A cute way to introduce toddlers to God's story is through the Candle Tiny Tots Lift the Flap Bible. This large board book features sturdy flaps on each page that young children can lift to reveal another part of the story or to answer a parent-guided question, such as what will happen next or why something happens. Lift the Flap Bible includes stories of Noah, Moses, Daniel, Jonah, and Jesus. These stories are very short and rely heavily on the illustrations, making the book a great conversation starter for parent and child. It is an interactive book meant for parent and child to sit down with together--but it is also a nice book to bring along to keep toddlers occupied during church services. The cute and colorful illustrations are vibrant and engaging. Different emotions are featured related to the stories, but in a gentle, non-scary way. The people in the field who are starving look worried, until Jesus provides food for them, and their faces show their comfort and bewilderment. Subtle details like this help introduce bigger themes to young children and prepare them for the full stories from Scripture. 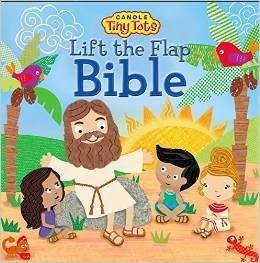 Lift the Flap Bible is larger than typical board books, with rounded corners and sturdy cardstock flaps.